Scallop season opened on Long Island less than two weeks ago and since then I've been creating recipes in my head and counting the days until I'd be in Southampton to buy a pound -- last night I made Peconic Bay Scallops in Pernod Cream Sauce and served them over Tarragon Mashed Potatoes. Amazingly simple and so delicious. These little babies are so sweet, and packed in a lot of liquor. Before I aproned up, I popped two into my mouth. There's nothing like "scallop sashimi" over a hot stove. I can't resist tender and fresh scallops and knowing they were in the bay just a few hours before. Can not resist. I sauteed a shallot before adding the scallops to the sizzling butter (and was sure to dry the them before cooking to create a golden brown caramelized crust (the meat has a lot of natural sugars and browns beautifully). 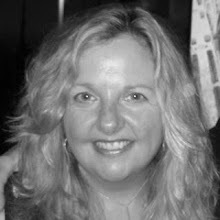 A few tablespoons of Pernod, a herbaceous spirit with a subtle hint of licorice flavor, and some heavy cream and voila! dinner was done. Serve over the super simple Mashed Blue Potatoes and Tarragon made with ingredients from the farmers market (except for the tarragon). 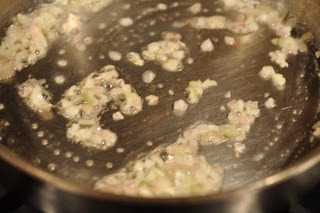 Melt half of the butter in a large heavy bottom saute pan. Saute shallots over low heat until translucent. Pat the scallops dry with a paper towel and set aside until the shallots are done. 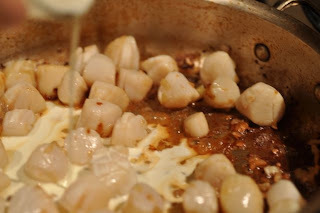 Add the remaining butter to the pan and when its bubbling, add the scallops. Raise the heat to medium-high, then saute for 3 minutes until golden and turn over to finish (no more than 5 minutes total). In a sauce pan, cover potatoes with cold water. Boil for 15 minutes and check for doneness. Drain and return to the pot. Using a potato smasher, mash the potatoes and add tarragon, heavy cream and butter stirring until creamy smooth. Salt and pepper to taste. 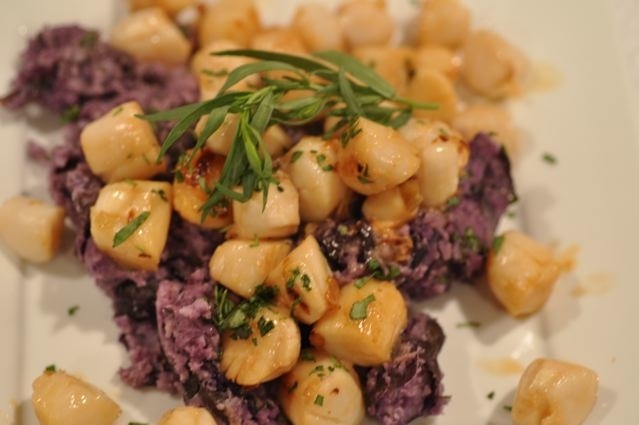 Read North Fork Patch "Wine Industry Types: Tips for Doing Bay Scallops Right" to see how local vintners are cooking scallops this season and this week's East Hampton Star's article "The Jewel of the Bay" for some interesting facts about scallops and more recipes. Bon Appetit. This year's Peconic Bay scallops are as sweet as ever and quite plump. 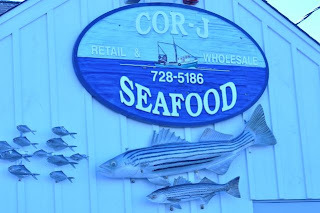 I was glad to find them at Cor-Js in Hampton Bays -- we stopped by the shop after a long walk on the beach with the dogs (it was warm fall day and the surfers were out - so wonderful). At $20 a pound, I feel I got a bargain. In prior years, the highly coveted Peconic Bay scallops have been as high as $25 and $27 per pound, maybe more. With an abundant harvest so far this year, the price is a little lower. Good news for locals. For more news on the harvest and history of bay scallops read East Hampton Patch "Bays Abound With Scallops This Year" and prior posts on Lighthearted Locavore, "Scallop Season Opens On Long Island" with links to 2008 and 2009 scallop posts and a history of scalloping on Long Island. 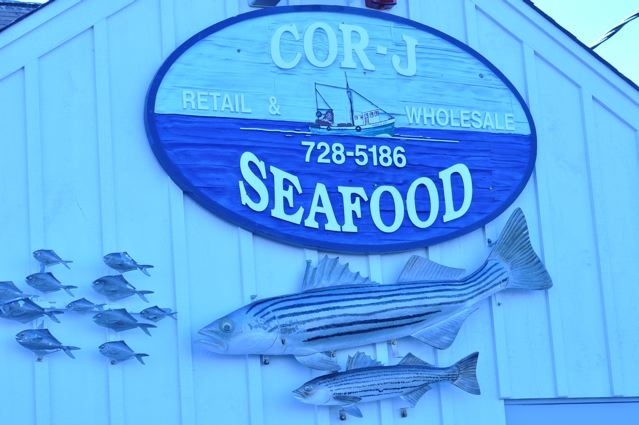 When I was shopping at Cor-Js I noticed they were selling large sea robins. Do you know a good recipe for local Long Island sea robin? 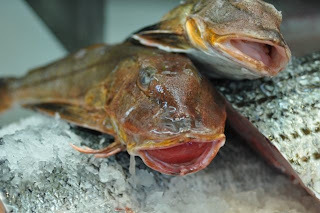 They are so cute despite their lowly reputation and remind me of catfish. scallops look great--local seafood is the best. great post! This look so delicious! Dont' you love it when something starts for its season? I think when you eat seasonally you really do appreciate and celebrate your food differently! Beautiful post. 2peasandapot and Boulder Locavore -- as you know, there is nothing like locally grown AND a delicious recipe. So easy and so good! Love both of your sites too (gave a shout out on twitter). Doggy Bloggy -- these scallops are so plump this year and sweet too. Enjoy.